What is the difference between Docker and a Virtual Machine? How to Install a Docker Container on CentOS 7? Previously we have seen the installations of hypervisors like Xen and cloud middleware like openstack. Recently a new technology called docker container has become the hottest trend in application development. In this article we shall see the what exactly is a docker, its differences with virtual machines, installation of docker and its usage. With different architectural approach, containers are much more portable and efficient, even though they have similar resource isolation. 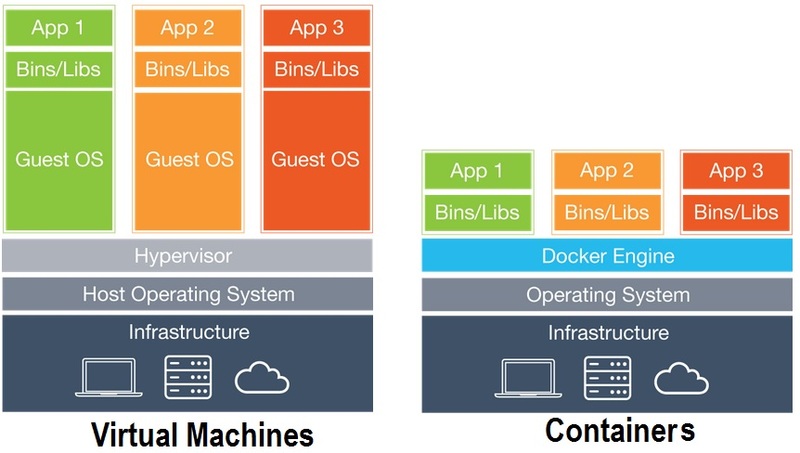 Below pic shows the architectural difference between a container and Virtual Machines. The latest official release of Docker is v1.10. Below instructions is for installing Docker Container on CentOS 7 server. Login to the CentOS 7 server as root and follow the below steps. Step 2: By default Docker is included in the CentOS-Extra repository. If you would like to use a more up-to date version of docker, run the below command to add to repo. Step 3: Install docker package and docker-registry. Docker registry is a stateless, highly scalable server side application that stores and lets you distribute Docker Images. Step 3: Upon successful installation of docker, start the docker service. Mar 22 17:10:12 vm1 docker: time="2016-03-22T17:10:12.541577770+05:3...1"
Mar 22 17:11:05 vm1 docker: time="2016-03-22T17:11:05.429417681+05:3...0"
Mar 22 17:11:05 vm1 docker: time="2016-03-22T17:11:05.429730128+05:3...s"
Mar 22 17:11:13 vm1 docker: time="2016-03-22T17:11:13.020019713+05:3...0"
Mar 22 17:11:23 vm1 docker: time="2016-03-22T17:11:23.021293894+05:3...e"
Mar 22 17:11:28 vm1 docker: time="2016-03-22T17:11:28.600657892+05:3...n"
Mar 22 17:11:35 vm1 docker: time="2016-03-22T17:11:35.938950613+05:3...0"
Mar 22 17:11:45 vm1 docker: time="2016-03-22T17:11:45.939810804+05:3...e"
Mar 22 17:11:57 vm1 docker: time="2016-03-22T17:11:57.720737864+05:3...n"
Step 1: Run a basic Centos container with a bash shell. Here, -i option attaches stdin and stdout, -t allocates a tty. That’s it! Now you’re landed onto a bash shell inside a centos docker container.